WARNING: If you're squeamish about the topic of cremation, kindly watch a cat video on YouTube rather than read this post. Seriously. Okay, now that we've weeded out the faint of heart, I want to talk about the popular topic of cremating loved ones. I should state for the record that I aspire to one day being cremated and ending up in a columbarium or memorial garden to be named later. Also, I aspire to become the oft-maligned "dead white male" but that's another issue. Today I want to write about two things in particular -- one trend I'm not entirely comfortable with and one industry practice that surprised me. Occasionally I'm asked to divide up ashes for family members. This isn't as macabre as it sounds, at least for someone who is used to dealing with death and dying. Ashes are typically delivered by the funeral home after they have received them from the crematorium. They arrive in a plastic bag inside either a cardboard or plastic box and are heavier than you might imagine -- ashes for the average adult weigh between five and nine pounds. At the last two parishes I've served there have been memorial gardens with direct internment of ashes into the earth. I love this because of the whole "ashes to ashes, dust to dust" imagery. The sexton digs a hole and at the committal service the ashes are poured directly into ground before being covered back up with dirt. But back to the dividing of ashes. Like the fake word "cremains," I don't like it. I always do it, generally for pastoral reasons, but personally I know I'd like to be kept in one place when I'm a pile of ashes. 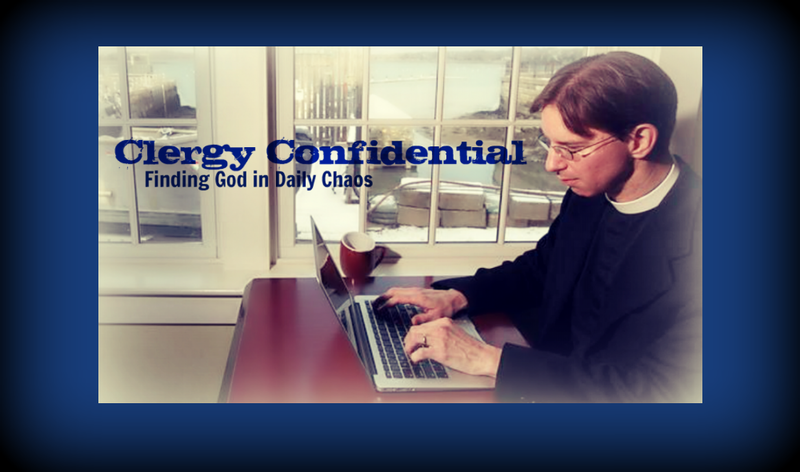 It's not a theological issue -- God can sort out and reassemble ashes whenever the time comes. I'm not worried about that. I do worry about the effect on the grieving process for family members who insist on taking some ashes for a locket or a bracelet or to place on the mantle. 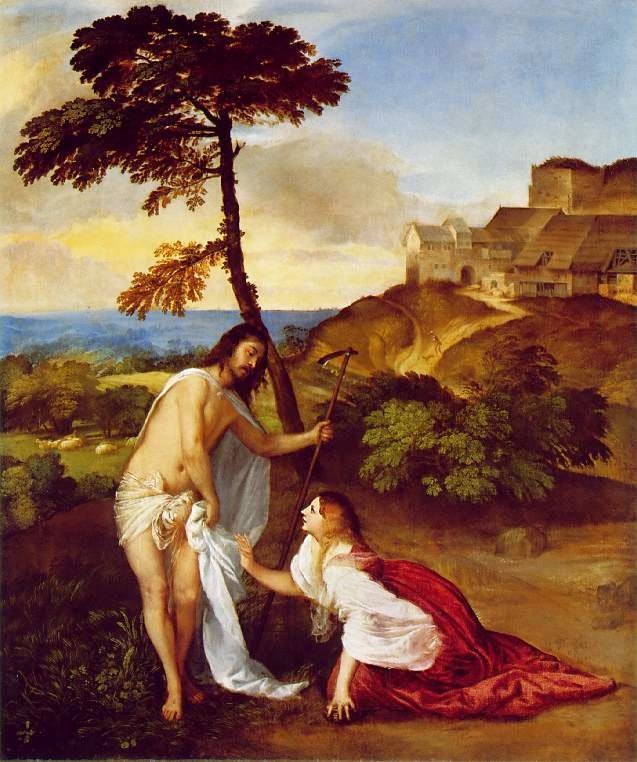 In John's gospel (20:17), after the resurrection Jesus says to Mary Magdalene as he departs, "Do not hold on to me." Or, in Latin, noli me tangere (literally "touch me not)." There's good reason for this not just because Jesus has elsewhere to go but because we need to let our loved ones go to their glory. They live on in our hearts, our minds, our souls, our actions, and our lives but we have to free them for the journey home. It's difficult to do that when they're literally around your neck. Please, let them go. 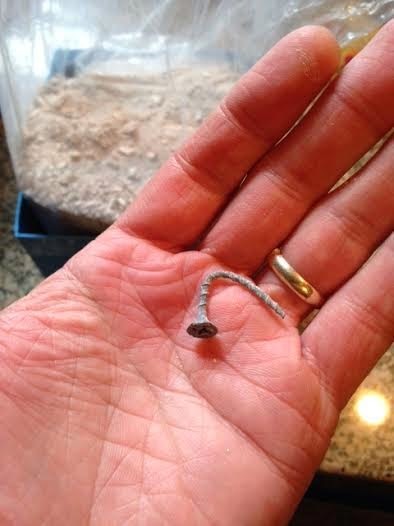 I've been thinking about this because I recently found a bent screw in a pile of ashes. I thought that was bizarre since the deceased was not a robot. So I called the funeral director to ask him about it -- they don't do the cremations themselves since by state law they can't. So he told me that when they do cremations they include the casket. I had no idea! Then they use powerful magnets to pick up any metal that might be mixed in. This particular screw slipped through. He also said they do the cremations with the caskets not just for "dignity" reasons but because without a casket in the mix there are a lot fewer ashes. This implies that without the casket human ashes alone would be too skimpy. Perhaps you knew all this. Again, I had no idea! And I'd also be fine with fewer ashes to bury. So there are my cremation thoughts for the day. Enjoy the upcoming holiday weekend and try to stay on the earthly side of the grave over the next few days. Not sure where you got the info, but some of it is slightly off. The temperature that a body and casket/ box are exposed to in the process is so high that no organic matter remains. The only thing left is the material that is skeletal (bones) and any metal. In order to make it a more palatable process those bone fragments are ground in a machine into what is sand. We call them incorrectly ashes, but really they are bone fragments. In think about how the church in ancient days often took relics of famous and saintly Christians to be placed in various holy places and churches. I don't see much difference in a family doing the same. I'd rather see them scatter them than pay horrendous amounts of money to put them in an niche somewhere. Since no one believes anything without proof, this is from a cremation textbook: "Although cremated remains are commonly called “ashes”, in truth they are comprised of pulverized bone fragments. As was previously mentioned, the cremation process destroys all traces of organic, carbon-based matter and all bodily fluids evaporate and escape through the cremator’s exhaust. Since absolutely no organic material remains after cremation, human ashes do not present any sort of health hazard to the living or the environment. The extreme heat of cremators also means that little to no traces of the cremation casket or container (regardless of the material) will remain to mingle with your loved one’s ashes. There may however be some minor traces of materials that were with the body during cremation such as implants, fillings, coffin fittings, and so on but these will most likely be detected and removed when the ashes are passed through the magnetic field after processing. The only thing remaining of the human body after cremation is part of the skeletal structure and occasionally small amounts of salts and minerals." Our local funeral home provides biodegradable containers, which we place into the memorial garden with the remains during the committal. The expectation is that the container will dissolve over the course of a year. I have no objection to placing the remains directly into the ground, but the container is helpful for family. We encourage family to use a cardboard box rather than a casket (unless there is a viewing) for cremation. It is my practice to accompany the casket into the crematory to say the words of committal. Sometimes there is a family member present. 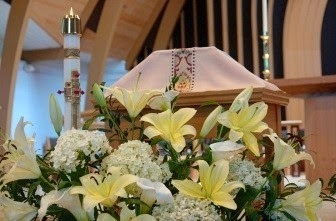 Sometimes we place flowers on the box/casket. WE live in a very small town, so this is easier to do than in much larger venues. But even the funeral director finds it comforting to know that this part of the work they do is accompanied by prayer. I share your desire to release the mortal remains - but often that is what my parishioners are doing. With scattered extended families, they are taking a portion of their loved one to another burial place. Or in my case, a portion of my husband's ashes to consign to the deep off of his childhood home in Florida. Good post, Tim! I will not divide ashes. I've been asked to do so and have refused and explained why (basically, I suggest it marks disrespect of the deceased). I may add your thoughts to the rationale, as well. -- And I couldn't agree more about "cremains"! What a stupid word and yet another bit of evidence of our fear and denial of death. It is not necessary to have a casket. Readers might explore "direct cremation." Though there are many good funeral directors, often they are quite expensive and you do not have to go through one for cremation of a loved one. I agree about the terminology ... plain old "remains" seems fine to me and I use the term "enclosed" for the placement of them, as in, "his remains were enclosed in the columbarium." I believe the requirements for having a casket vary from state to state, and I cannot believe that is not for financial reasons . . . funeral directors have to eat too, you know! 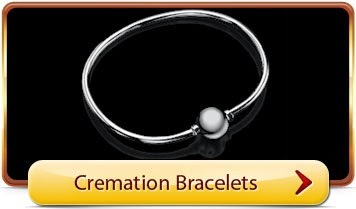 In the Victorian era people cut off locks of the deceased person's hair and put them in mourning rings--I have one from my family, but whose hair it is, I have no idea--so the cremains bracelet is not a new concept. But I find both ghastly and when someone shows me a necklace or whatever and tells me that it contains a piece of Mom, I am at a loss for words. I agree that the dead should rest in piece--one piece, one place. My mother moved to California, where she lived until her death. Since we were living in Virginia, I had her cremated and then shipped back to us for a funeral service and internment in a columbarium. When her ashes arrived, I do not think they were mingled with a casket because they were not 5 -9 pounds. However, the experience of getting her remains in the mail completely undid me. There are just some things for which we are not prepared, no matter no rational we think we are. Actually Tim there is a law,MA or local town I'm not sure...or so I'm told...that putting ashes directly into the ground is not allowed, have to be in one of the aforementioned biodegradable containers. Why I have no idea...same result, just slowed down a bit. I personally want to be wrapped in a shroud and buried without preservatives into a green burial site...legal in MA, just not sure where one actually exists. Now, for a really sobering experience...ever been to a crematorium with a family to watch the body on the conveyer belt go into the flames? I had to take the rest of the day off....The crying of the family was wrenching.